Uttarakhand remains to be one of the most sought-over destinations amongst trekkers when it comes to 'adventure activities'. It is blessed with supreme and majestic range of mountains, which offers breath taking views and unexplored pristine locations. The unique aspect and experience of trekking at Uttarakhand is that, it provides challenging and nerve-wrenching treks for those passionate, professional trekkers and at the same time gives immense opportunities with a lesser degree of difficulty to amateur tourists. Trekking is one of the main adventure sports of Uttarakhand, and witnesses a steady inflow of tourists across the globe. In short, Uttarakhand can be termed as a 'trekker’s dream destination'. Here are a few famous trekking destinations in Uttarakhand.. The trek from Chopta to Chandrashila summit is very famous amongst passionate trekkers. This summit offers a 360 degree view of the mighty Himalayas. The distance between Chopta and the summit is close to about 6 km and takes around 5 to 6 hrs to reach the destination. As the trek starts one can get the fresh whiff of the green trees and moist air. The whole stretch is covered with thick vegetation ranging from colourful rhododendrons, oaks to deodars. It is rich and diverse in its variety of flora and fauna. If you are a first timer, you can make use of the iron railings almost all along the trail till Tungnath. Being one of the most famous spots of Panch Kedar, Tungnath, falls in between the trekking trail of Chopta and Chandrashila summit. The trail from here to the summit gets a little tougher, but proves to be worth the climb on reaching the destination. This small flat hill-top offers a great view of many mountains like the Kedar, Nanda Devi, Banderpoonch, Trishul and Chaukumbha. If one wants to enjoy a trek during winters, Dodital is the apt choice. Trekking in the snow offers a different and exhilarating experience.The trek starts from Uttarkashi and is about 21 km. There are many camp sites and shelters for overnight stays or short breaks. The trail takes you under the vast canopy of trees which are covered with snow during winters. There are about two-three fresh water streams where one can refill potable water. The trail amidst the thick foliage of pine trees, zig-zag paths tucked along the mountain, picturesque stone bridges and small huts make the trek more fascinating. As you reach the huge open area one can see a beautiful crystal clear stream gently slithering down from the Dodital lake. The lake is famous for its golden trouts and is situated at an elevation of about 3,024 mt. This place is famous for bird watching and angling. Owing to low elevation, Dodital remains accessible almost throughout the season except during monsoon season (June to September). Another five-kilometer walk ahead of Dodital takes you to Darwa top, which offers a breathtaking view of Banderpoonch and Swargarohini mountain ranges. Since it is considered to be the birthplace of Lord Ganesha Dodital holds spiritual significance. Also known as the Hanging Valley of Gods, this is a good trekking destination for beginners, owing to the level of ease. The extent to which this place is bestowed with abundant beauty can be witnessed only when explored. The area falls under the Govind Pashu Vihar Wildlife Sanctuary and the prospects of witnessing rare species of fauna is abundant. The trek begins at a small village Netwar manoeuvring through the thick and dense foliage until Osla, further, one has to walk through lush meadows and terraced hilly fields to reach the Valley. This place remains unaffected by any external influence which is evident in the lifestyle of the inhabitants and the construction of the houses. The serenity, tranquility, panoramic view the Valley offers has no parlance. The trek from Thalisain to Binsar via Pauri is filled with scintillating experiences. 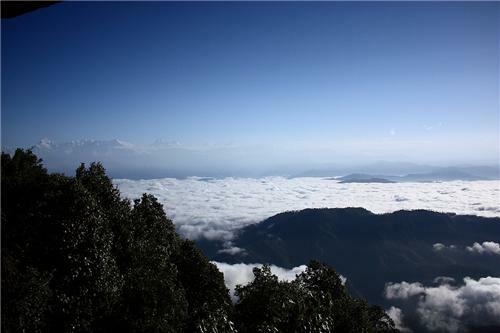 Binsar trek is rated as moderate, with gradual rise and fall. The whole trail is dotted with pines, oaks and deodars. This place remains to be a favourite destination for ornithologists due to the variety of bird species spotted. It is also interesting to see a wide variety of hanging mosses and wild ferns adorning the track. Once you reach the Binsar Summit, you can get an uncluttered view of many famous peaks like the Nanda Devi, Nand Kot, Chaukhamba and Trishul. 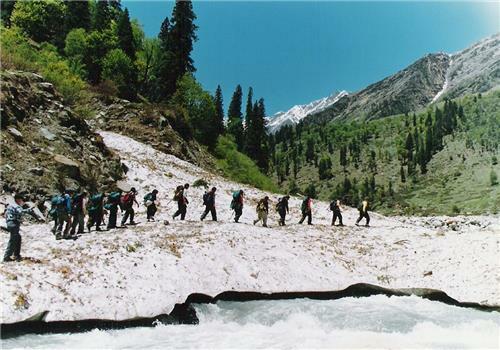 The Khatling trek is indeed for professional trekkers and is classified under the ‘tough’ category. The source of this glacier being the Bhilangna river, offers stunning views of the snow-capped mountains and hanging glaciers. The trek is for about 45km and begins at Ghuttu. During the trek one passes through dense forests, lush meadows and remote villages. The trek offers great moments for shutter bags, adventure enthusiasts and nature lovers. Since it needs a great amount of both mental and physical endurance to finish this trek, it gives immense satisfaction to those who accomplish this great ordeal. Along the trek, one gets to view the lifestyle of the inhabitants, terrace farming, Tehri dam, grass lands, wooden temples and giant oak trees. This mystical land laid concealed for centuries from the human race. The valley of flowers remains buried under snow for most part of the year. When the snow melts, the whole place turns in to a fantasy land filled with bursting colours of the blooms. The trek to this place begins at Govindghat and proceeds towards Ghangria which is close to about 14 km. The trek is a combination of both moderate and tough ascents and descents. Careful maneuvering and sticking to the trail is the key to reach the destination. The whole trail is filled with picturesque spots, small hamlets, streams, rivulets, variety of flora and fauna as one moves further walking along the Lakshman Ganga river. 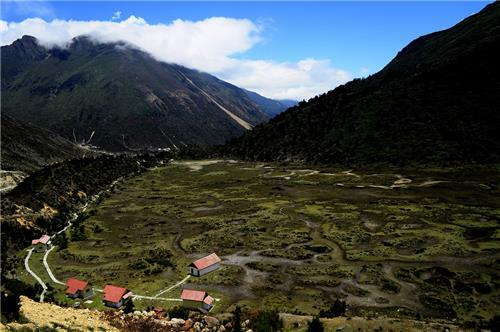 Ghangria serves as a base camp to the Valley of Flowers, since there is no permission to stay in the valley. It is a climb of another 3 to 4 km. The path from Ghangria bifurcates in to two, one path leading to Hemkund Sahib and the other leading to the Valley of Flowers. As one crosses, the wooden bridge there is a sudden transition and the air is filled with the sweet fragrance of the flowers. The whole expanse makes you feel as though one is standing amidst an ocean of flowers. The meadows keep stretching boundlessly into the horizon. This trek proves to be fruitful as you enter this fairyland. This could well be a short and crisp weekend trek, which will leave us with a scintillating freshness. If you are planning for a trek during winters this place is one such, you might want to keep in mind. It is around 2.5 km trek from the place called Sari village and takes close to about 2 hours at an easy pace due to the steep inclination. Most part of the trek is marked by thick vegetation, except the start where one can find the trail clear of any dense vegetation. As the trail unwinds one can find the rhododendrons in bloom, further the path paves way giving the most picturesque view of the Garhwal mountain ranges in the horizon. As you leave behind the Sari village and reach almost on the other side of the mountain the trail opens out in to a beautiful landscape with the ‘Deoria Tal’ amidst the lush green carpet of meadows. 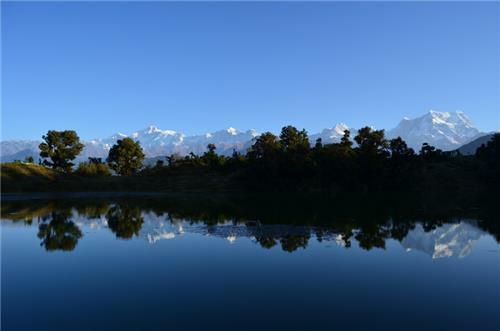 This trek could be well combined with the Chopta – Chandrashila trek, if time is not a constraint. The trek to this mysterious lake has been gaining importance amongst trekkers and tourists in the recent years. This trek is sure to leave you with a happy, accomplished and a lifetime experience. It is dotted with meadows sprayed with flowers, gushing streams, barren mountains and thick snow. The trek to Roopkund requires utmost physical upkeep and mental endurance. It is indeed a tough one at the same time also a do-able one. The approximate trekking distance is about 53 km, the starting point being Loharganj. The trail passes through Didna village, Ali Bugyal, Ghora Lotani and Bhagwabasa. 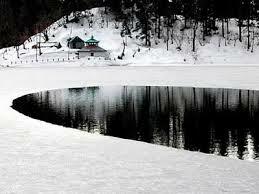 It cuts across thick forests, the Neel Ganga river, snow and open lands. This strenuous takes around 5 to 8 days depending on the physical endurance and weather conditions. The whole experience brings out the surreal beauty of the Himalayas. Trekking in the beautiful expanse of Uttarakhand opens up horizons and leaves one with a potpourri of experience. The ethereal beauty can well be appreciated as one gets to unfold the unexplored mountain ranges, gurgling streams, gushing rivers, snow peaks, flower sprinkled meadows and many more. The opportunity Uttarakhand offers is immense, it’s about time to gear yourself and explore the wild!! !